1. North Dakota set a new monthly oil production record of 11,540,000 barrels in June, which was above its year-ago level by 22% and above the June level two years ago by 79% (see chart above). Oil production this year has averaged more than 10.8 million barrels per month, which is double the monthly production levels in 2008, and triple the levels from five years ago. 2. 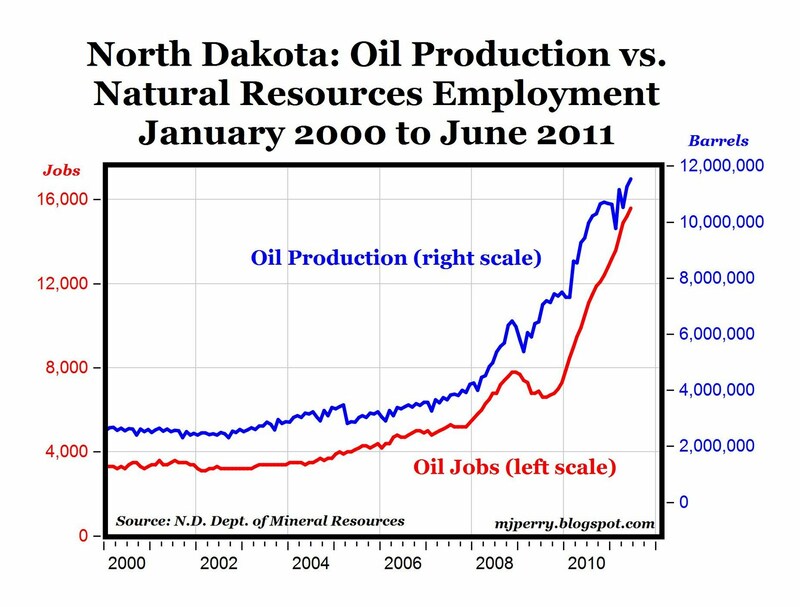 Oil-related employment in North Dakota has more than doubled in just two years, from 6,900 jobs in June 2009 to a new record of 15,600 jobs in June of 2011. While the national economy struggles with another "jobless recovery," North Dakota has continued to add jobs, and not just oil-related jobs. The overall state employment level reached an all-time high in May and was 2.5% above the June 2009 level when the recession ended. 3. North Dakota continued to lead the country in June with lowest state jobless rate of 3.2%, which was lower than second-place Nebraska's rate of 4.1% by almost a full percentage point, and was a full 6 percent below the national June jobless rate of 9.2%. 4. 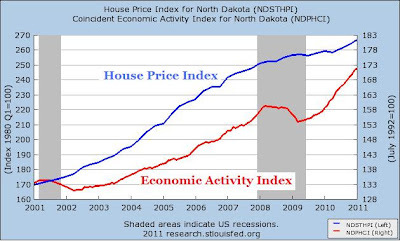 North Dakota home prices have risen consistently through the national housing bubble and subsequent crash, and reached an all-time high in the first quarter of 2011 (see bottom chart above). While the national real estate crash has brought average U.S. home prices back to 2003 levels, home prices in North Dakota have continued to appreciate every year even through the recession and financial crisis, and are now 42.5% above 2003 levels. 5. North Dakota's Coincident Economic Activity Index (based on employment, unemployment, wages and salaries, and average hours worked in manufacturing) is above its cyclical peak in early 2008 by almost 12% (see bottom chart above). Even in Texas, which gets all of the national attention for the state's economic success and job creation, its economic activity index is still slightly below the early-2008 peak. Bottom Line: North Dakota's impressive economic success clearly illustrates some of the benefits of domestic energy production: ongoing job growth, a jobless rate close to 3%, record-setting economic growth, and a bubble-resistant housing market. There's no reason that the economic success of North Dakota can't be duplicated elsewhere, if we would only open up more U.S. land and off-shore areas to domestic energy exploration and drilling. Sorry Mark but you are still missing the big picture. If a lot of money floods into a state it is not a surprise that the state will do well for a while. But the problem is sustainability of the good times. 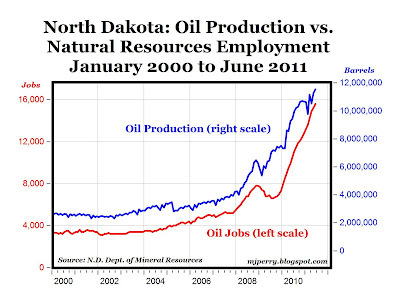 For that, the ND oil and gas production has to be profitable and generate positive cash flows. But at the moment there is no objective evidence that shale gas and oil are very profitable once the EUR and depletion numbers are accounted for. As I keep writing, there are a few players that can make a lot of money from shale but the industry as a whole cannot. "Drilling permit activity is high, but well below record levels due to road restrictions, weather and long waiting lists for fracturing services." This is hard earned oil and gas but obviously the economic rewards are far reaching. North Dakota also rides high on federal lard==they get net about $6,000 per capita every year from the feds. The state color is pink. New techniques and huge natural gas finds globally mean natural gas will be a saturated market for years, maybe decades. Some marginal outfits will get run out of business, as gas is so cheap. The good news is that methanol can be made for $1.20 a gallon from natural gas, and you can run cars on that. Or CNG. For crude oil, I suspect we have already hit Peak Demand, well before we see Peak Oil. Even with the unreliable thug states that control oil. The private sector innovates, responds. The public sector just gets more expensive. See military services and hardware. And here is the bottom line. Overall, the Bakken is likely to see further increases in production as the areas being drilled expand, but with the relatively short life of the well at significant levels of production, it is harder to see the higher levels of production overall that others have cited, and one also has to remember that is often the sweetest spots that get drilled first. It is hard to see much of an increase given the very high costs and the uneconomic nature of the shale formations that are not part of the sweet spots that were drilled first. To understand the issue all you need to do is apply very low level math. Failure to do so could get one caught in a huge trap, particularly if demand destruction causes prices to decline as they have before. When I was a kid the methanol promise was being discussed by those that did not understand the economics or the basic science. It has proved to be a very large loser and will continue to be that way for years to come. 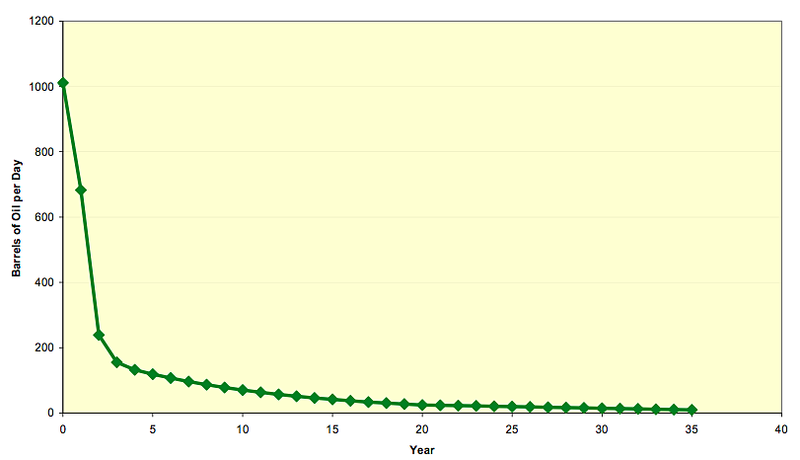 Light sweet production peaked in 2005. And if you know look at human nature you would realize that demand does not 'peak' in the way that you imagine. The price signal works, last time I checked. People respond to higher prices by..reducing demand. Demand for crude has been flatlined for years. It also flatlined for 10 years after 1979, if you check out BP data, and then only recovered as it become so cheap. As to methanol, who knows? Methanex is selling it today at $1.20 a gallon, and it has roughly half the BUTs of gasoline, so call it $2.40 a gallon. Some minor upgrading of fuel lines in vehicles is needed for a average car to run on methanol. Methanol was the fuel of choice for the Indy 500, until the ethanol crowd figured out the PR value, and started to pay to get ethanol into the race. Methanol has many advantages over ethanol, but mostly it is a lot cheaper and abundant. CNG is, of course, a proven success globally, with some like 20 million vehicles already powered this way. I sense the crude oil era is ending, and with a whimper, not a bang. That is the price signal at work. It smoothes transitions form one period to the next. Your figures regarding light oil are just silly. Who cares? So, except for other fuels we can use, supplies are getting tight? This is typical doomster talk. Add to that, the GM Volt is on the road and it works. Why is it not a commercial success? Gasoline is still so cheap. Because the Peak Oil argument is for demented creeps. Yes, the price signal works. In 1979 there was a great deal of electricity generation that used oil as a fuel. It was easy to replace that with nuclear or coal even as demand for energy went up. But that is no longer the case. We cannot replace oil's function as liquid fuel and feedstock for specialty materials with a cheaper alternative. This would mean that in order to squeeze out marginal demand prices will have to go higher. Whether that is $125, $200, or higher is anyone's guess. But let us point out that the price for the product is not sufficient to ensure a profit for the producers. What matters ultimately is the return on the energy invested. And that picture is very murky given the high energy content of shale oil production and the cost volatility in the sector. The changes are not 'minor.' You need a total overhaul of the distribution system. If demand for methanol goes up to replace gasoline so will the capital costs that will have to be passed on to the consumers. You will not be looking at $2.40 a gallon but a much higher total cost. And for the record, the Indy methanol experiment was related to the deaths of two drivers whose gasoline tanks ruptured. Methanol had a lot less energy and was safer. You also have to keep in mind that racing engines have a lot higher compression and do not last as long. It would help to do an apples to apples comparison and on that front methanol still loses. My brother-in-law works for a big distributor of CNG fuel in China. Much of the taxi fleet that I saw was using it. But that would require new infrastructure as well and would not be as cheap as you imagine. I doubt this very much. While production will peak we will still have decades of production before we undertake a full switch to something else. The problem is that there is nothing as cheap to replace gasoline as fuel at this time. It is reality. This is why the hundreds of billions in new investment have failed to materially increase production over 2005 levels. The Volt is a failure because consumers do not want it as much as the government wants them to want it. And gasoline is cheap because we just went through a major economic contraction that hit the real economy very hard. If the economy improves the price will explode again until the rising costs push the economy into a contraction again. "The Volt is a failure because consumers do not want it as much as the government wants them to want it." The Volt is ramping up production to meet large waiting lists. It is now available in quite a few states, but more than half of the U.S. won't have Volts until Q4 of this year. Waiting lists? I think that you are unfamiliar with the facts. Sales of the much-hyped Chevy Volt fell to new lows as did GM share price as July auto sales figures came in. Only 125 Volts were sold during the month of July. Recent reports attributed the slump to supply constraints as GM spokeswoman, Michelle Bunker, was quoted as saying that the Volt was "virtually sold out" and only a "few" were available nationwide. I have confirmed that this statement is not entirely truthful and have gotten clarification from GM through Director of Communications, Greg Martin. There are lots of cars available but sales have fallen as consumers have rejected GM's much hyped electric vehicle. This is not a success story. It is one of utter arrogance and failure of subsidies and central planning. "There are lots of cars available but sales have fallen as consumers have rejected GM's much hyped electric vehicle. This is not a success story. It is one of utter arrogance and failure of subsidies and central planning." In the 8 months for which there are sales figures, there have been a grand total of 3200 sold, with March 2011 being the peak month at 608. If GM were anticipating high sales volumes, I would think they would have made a few more than that, so apparently they didn't have high expectations after all. A clever spinmaster could claim that 2011 sales are already up 780% from 2010, but I don't think that would change the fact that this car is a bust. Large fleet sales to government agencies on the taxpayer's dime won't make it any better. Well if fools want to cast their lot and some of 'our extorted tax dollars' at the Chevy Volt what will they do if Obama doesn't win in the next go around? Only 3975 Volts have been produced for the 2011 model year. The 2012 production should begin to fill demand. Let's give this car a chance to be sold nationwide instead of just a few states. There might be some shenanigans in dealers collecting gov't rebates for Volts, but this needs some invistigation. Would there even be a need for this kluge of a vehicle if there hadn't been a history of opposition to domestic oil drilling? The 2012 production should begin to fill demand. As was pointed out to you above, there are four months of supply in inventory. I would say that demand is very low even with all of the handouts given to purchasers. The Volt is terrific technology. But gasoline is still under $4 a gallon (and falling) despite years and years of hysteria and hype by doomsters and speculators, and OPEC, and most oil being controlled by thug states, such as Venezuela, Mexico, Nigeria, Libya, Iraq, Iran, Saudi Arabia, Russia etc--boy that is an ugly roll call, no? And still gasoline is cheap. And still CNG is taking market share. And still people can buy higher and higher mpg cars. At $6 a gallon, the Volt--a wonderful car--might become a commercial success. I doubt that it can succeed without massive subsidies. If it succeeds in a competitive market it will have to be improved a great deal and the costs would have to come down. "At $6 a gallon, the Volt--a wonderful car--might become a commercial success." Why would I buy that thing instead of just waiting for the plug-in Prius, a car based on a proven success, that should be cheaper?